Psychedelic / Progressive: my favourite KC song tells a complex story in epic fantasy mode. Sinfield's lyrics form the basis of meaning & the music augments the adventure. Lake at his vocal best with excellent melancholic phrasing & MacDonald's mellotron runs evincing ennui. Drums (Giles) punch the message through any thick skull.<br><br>It's about colour (drugs): how it impacts on us to evoke emotions & associations. What are the colours? Rusted, purple, crimson, black, brass, fire, evergreen, prism, patterned, gray, and yellow.<br><br>It's about hierarchical leaders (power): how to maintain the status quo. Who are in the hierarchy? Piper, king, keeper, pilgrim, queen, witch, gardener, juggler, widows, wise men, and jester.<br><br>The protagonist is a seeker but helpless to effect any significant change in circumstance: "I walk a road... I wait outside... with insufficient schemes... I chase the wind of a prism ship... 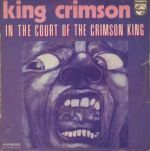 I run to grasp the divining signs..."<br><br>But of course, _we_ are the protagonist & our leaders hold the power "...to satisfy the hoax ...and smile as the puppets dance..."
Prog-Rock ist nicht unbedingt mein Herzensgenre, aber King Crimson konnten schon was. Beweist auch dieses Meisterwerk von einem Fast-10-Minuten-Monolithen, der gefühlt zwei Dutzend (großartige und großartig klingende) Ideen zu einem schlüssigen Gesamtwerk zusammenformt. Unglaublich gut.<br>Edit: Aufwertung, ganz klar. <br>Hat schon was faszinierendes an sich. 4,6*<br><br>1969: #80 USA.